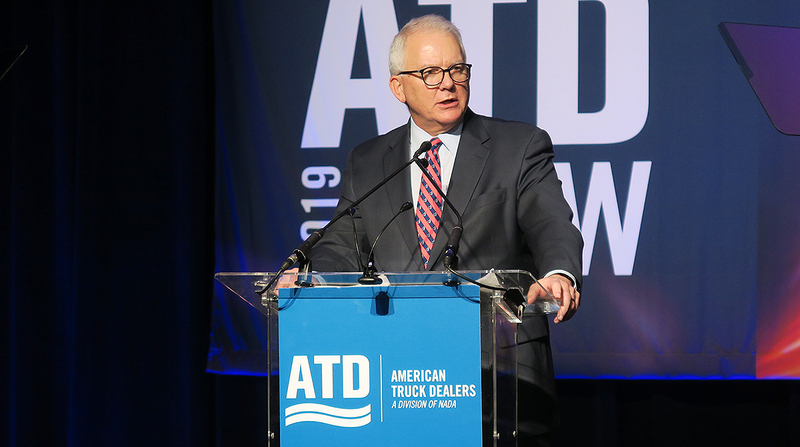 SAN FRANCISCO — Paccar Inc. CEO Ron Armstrong said the trucking industry is moving toward ever-cleaner and more energy-efficient vehicles and will adopt increasingly advanced automated driving technology to assist drivers. Paccar is the parent of Kenworth Truck Co., Peterbilt Motors Co. and international brand DAF Trucks. Federal Phase 2 greenhouse-gas emission standards will result in the introduction of more aerodynamic trucks and new engine technologies to meet regulatory requirements, Armstrong said. He also predicted that fleet consolidation will continue as carriers seek to improve equipment utilization and overall efficiency. That trend will boost adoption of connected-vehicle services, as well as advanced driver-assistance systems to increase safety and efficiency while reducing fleets’ dependence on highly skilled drivers, he added. Over the next five years, truck manufacturers and fleets will increase field testing and low-volume production of electric-, hydrogen- and hybrid-powered trucks to determine the best applications for those vehicles, Armstrong said. He highlighted Peterbilt’s lineup of battery-electric prototype models, Kenworth’s tests of hydrogen-electric trucks and DAF’s hybrid and electric trucks for the European market. Armstrong said there could be an important place for diesel-electric hybrids in the commercial vehicle market by 2024, when the second stage of the Phase 2 GHG requirements goes into effect. “A parallel hybrid solution could be an effective technology to reduce fuel usage and CO2 output in most, if not all, of our powertrains,” he said. In the near future, Paccar plans to introduce next-generation driver assistance features, including steering assistance, enhanced active braking and traffic jam cruise control at low speeds. Those capabilities would build upon active safety systems that already are available, such as collision mitigation, lane departure warnings and blind spot monitoring. The truck maker also is investigating autonomous driving technologies such as auto docking, which could automatically maneuver a tractor trailer into a loading dock. Beyond that, Armstrong said Paccar is developing trucks with driver-assist technology that would offer SAE Level 4 automated driving capabilities, in which the driver can completely disengage and let the system take control under certain conditions. Another area of interest is expanding connected vehicle services and utilizing vehicle and operational data to offer new products and support fleet customers. Some of the truck maker’s development work on emerging technologies is taking place at the Paccar Innovation Center in Silicon Valley, which opened in September 2017.